Petite France is a name given to the small area between the rivers, just south of the Grande Île. 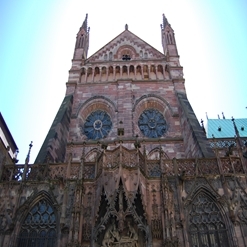 It is home to some of Strasbourg's prettiest and most photogenic streets and buildings, with half timbered townhouses leaning out over the narrow cobbled streets. Petite France resembles Colmar, a city an hour south, with picturesque canal and half-timber houses.